The sacred Hindu island of Rameshwaram is connected to the mainland by a railway bridge and is believed to be place where Rama crossed over from Sri Lanka after killing the demon Ravana as narrated in the Ramayana epic. The Ramalingeshvara temple complex, situated to the north of the island, was built during the Nayaka period in 17th and 18th centuries. The complex is contained within high walls entered through tall towered gopuras which lead to the various enclosures. There are approximately 1,000 meters of corridor length in the temple. 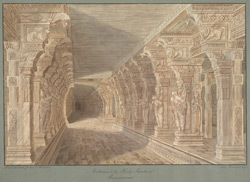 This drawing shows the receding perspective of the piers of a colonnade which have shafts adorned with scrollwork and lotus designs and are carved with figures in high relief. The large pendant lotus bracket rest on crouching yalis.